Handheld and mobile tours are made simple and on your fingertips nowadays. There are many scientific organizations that make and create these apps for museum maps and tours. Nowadays maximum people carry smartphones and so the preference of apps is very high. These apps provide with the information about what to see in the museums and also they give an idea about the maps of the respective museums. Videos are uploaded so that one can get interested in going there and find it really easy to watch what they want. Images, offline maps, multilingual content, audio and custom branding are all put into the apps. One finds it very easy to roam about in the museums and to learn about artifacts present there. Even persons from other countries find it easy and helpful as they can see the content in the language they are comfortable with. All the hard stuff like format conversion, app store submissions, development and designs, hosting are taken care by the company creating the apps. The heritage organization’s authority can have control of what is being implemented in the apps and they can edit or delete or update the gallery contents as well. The museums can be brought to life by using these apps. The multimedia tours can be accessed from any smartphones and tourists or visitors can have video guide tours and audio guide tours to increase their educational experiences regarding the museums. GPS enabled maps can be added in the museum tour apps and the visitors can find absolutely what they are looking for very easily. Offline maps are also put into these apps. Proximity beacons are used indoors for creating interactive experiences in these apps and the visitors get interested as they walk within the museums. These apps are updated very quickly. Any changes in the exhibitions or events in the museums are updated real quickly and this is one of the unique features of these apps. Scavenger hunts or games can also be added according to the needs or wish of the museum authority. The audio and visual additions to the apps always tend to enhance the interests of the visitors and it adds to their interest when they find exhibits very easily. Tours can be conducted by the museums through cell phones. So there will be no hassle of conducting audio tours within the museums. The expenses of the community are cut down in this way. On the other hand, surveys can be made on museum visitors for immediate feedback. The apps run almost on every platform like the iOS, android, windows etc. The accessibility to these apps is very easy and also there are other helping options for the visually impaired or hearing impaired persons. These apps can help both the museum authorities and the visitors in many more ways. There are no hassles of typing URLs and wasting time. Visitors can rather just download these apps and get all the information they need at their hand’s pace. 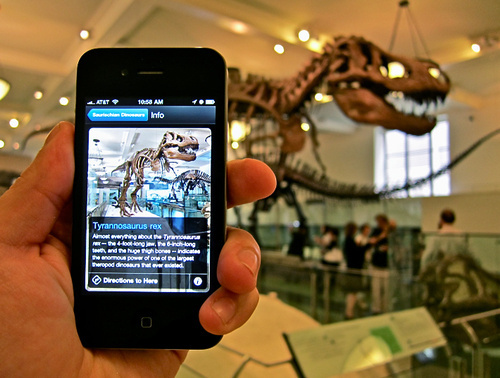 Museum tour apps are real guides to your next tour to museums.